I know, I know...I'm tardy to the party! (Or in this case, fiesta.) Cinco de Mayo has come and gone, but I'd like to consider the beloved south of the border celebration just an appetizer to satiate our palates for an entire spring of Mexican inspired cuisine, starting with these Spicy Tequila-Lime Fish Tacos. The crux of these fish tacos is freshness and simplicity; a hallmark of springtime cooking. As I sat at my Cinco de Mayo potluck on Sunday, stuffing my face taco after taco as if I might never eat again, I had a slight epiphany: why do we gear up for this holiday as if it's the only time of the year we can eat great Mexican food? We should be eating great Mexican food all the time! Indeed, quite the easy-breezy weeknight dinner does the fish taco make: the fixings are quite budget friendly (corn tortillas, salsa verde, queso, black beans), and prep assuredly easy. My favorite part is putting it all together, assembly-line style: delicately stuffing the mini taco yields such delightful anticipation for the two-bite fiesta of flavor to follow! On to the recipe: as the tequila lends a subtle sweetness and depth to the marinade, I looked for the perfect balance of citrus, spicy and zest to compliment it. I found it in the following ingredients: lots of fresh lime juice for the acidity, jalapeño, chili powder and cumin for the spice, and fresh garlic and cilantro for an herby tinge. Lastly, a touch of triple sec to sweeten everything up a bit and bolster the tequila. Hmm...you've covered all the ingredients for a margarita in this marinade. Yep, grab some sugar, and I highly recommend making one on the side! 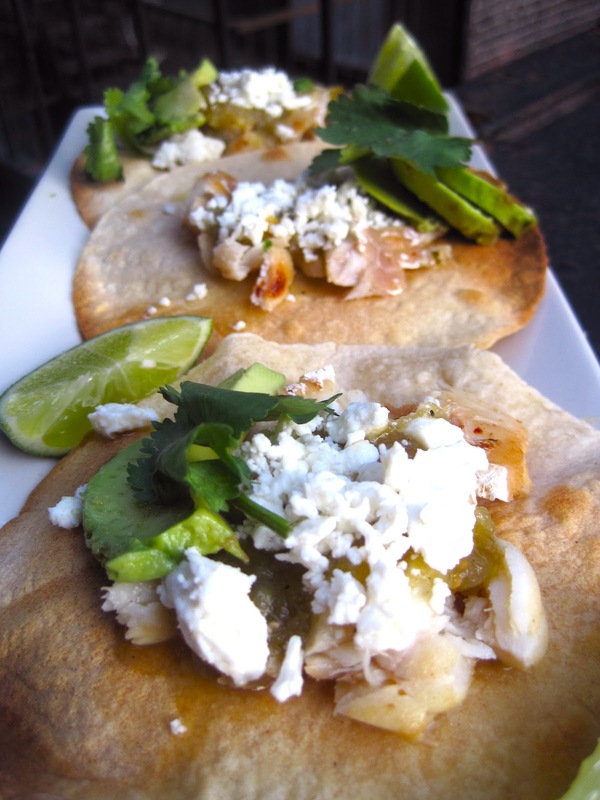 Keeping in mind first and foremost the "light and refreshing" aspect of these grilled fish tacos, I chose to top mine with a mild salse verde, queso fresco (or feta cheese), and thinly sliced avocado. You can use flour tortillas as an alternative to corn, but corn tortillas are whole-grain and thus a more health-conscious option than a refined flour tortilla. They also offer a chewy sweetness that pairs nicely with the alcohol-marinated fish. Other optional add ons: try shredded cabbage or spring radish slices for a veggie-full filling, or light sour cream (turn it into a "chipotle aioli" by adding in a minced chipotle pepper and dash of honey) for creamy toppings. 1. Mix together lime juice, tequila, triple sec, cilantro, garlic, cumin, and chili powder in a small bowl. Place fish in a large shallow bowl and pour marinade over to coat. Cover bowl. (Alternatively, pour marinade into a large ziplock bag and add fish.) Place in refrigerator for 1-2 hours, turning once. 2. To grill: Heat grill, and remove fish from marinade. Season with salt and pepper. Cook until fish is done and lightly charred, about 4 minutes per side. To pan-saute: Heat 1 tablespoon olive oil over medium high heat. Remove fish from marinade, season with salt & pepper, and cook until fish is done and lightly browned on each side, 4-5 minutes. 4. Assemble tacos. Coarsely chop fish, and divide evenly amongst tortillas. (If using black bean mash, spread on tortillas first.) Next add shredded cabbage and/or red onion. Top with a scoop of salsa, crumbled cheese, avocado slices, and cilantro for garnish. Serve with lime wedges. Those look AMAZING. Great photos! Any recommendations for a vegetarian alternative to the fish? Tofu will definitely lend itself well to the marinade. Use firm on the grill for a meatier protein, and silken in the pan for a melt-in-your-mouth texture.